DuckTales for the NES is one of those legendary games you hear people refer back to when they talk about the days where cartoon-licensed video games weren’t of dubious quality. Me, I grew up not really “getting” the game. DuckTales was obviously from a different era; an era in which you had to fend for yourself with games and actually read the instruction manual to understand anything about what to do. I had come years after this era. To the untrained eye, DuckTales looks like just another action game, but its distinct emphasis on non-linear exploration left me bewildered. The game seemed arbitrary and confusing; I would aimlessly wander around levels until eventually stumbling on a boss encounter and then be dumped back at a level select menu. It didn’t make any sense. What was the point of it all? What was my overarching goal? There didn’t seem to be one. It wasn’t until I watched somebody guide me through DuckTales within the last couple years that the game finally clicked with me. The door opened, and suddenly, yes: DuckTales was awesome. Scrooge seems to employ some giant people – look at the size of those doors! 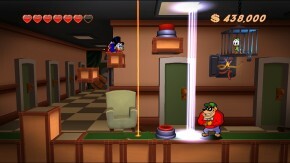 When WayForward announced DuckTales Remastered, alarm bells immediately began going off. 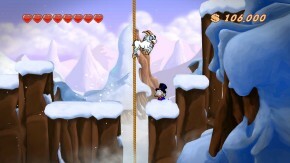 Pre-release media suggested that the game was going to receive massive changes: though they never outright said it, a making-of documentary seemed to imply that the game had been dumbed down and streamlined in to the same kind of linear action game I originally assumed it to be so many years ago. To make matters worse, teasers suggested an inordinately large amount of spoken dialog – video from conventions made it to look as if you were being stopped every few feet for Scrooge to banter on with Launchpad or his nephews for extended amounts of time, completely destroying the flow of the game. It seemed as though DuckTales Remastered was becoming something that definitely was not the DuckTales NES we knew and loved. I’m happy to report that almost every single fear of mine turned out to be completely unfounded, and DuckTales Remastered even goes a long way to improving the original game. It’s actually kind of impressive how WayForward zeroed in on exactly what I originally found confusing about the NES version: the general lack of goal. The original game was mainly about exploring an area to collect money, and once you were bored with that, you could fight a boss encounter and move on to the different level. But there was nothing really stopping you from just amassing infinite wealth, by accident or otherwise. Levels were often built so that they constantly looped back in on themselves, almost like a Metroid game. It was easy to get lost and even easier to not know what you were even supposed to do in these areas. If you have fond memories of the cartoon, you’re in for a treat. Remastered corrects this by slotting a little bit of extra narrative in to the game. A brisk (and new) tutorial level in Scrooge’s money bin reveals a treasure map, leading Scrooge to travel the world in search of riches. From there, each of the game’s five levels play out almost like a miniature episode of the DuckTales Saturday Morning Cartoon, complete with fully-voiced dialog by most of the show’s original cast. While I was fully prepared to be completely annoyed by their constant nattering, the moment I heard the original voices for the Beagle Boys all of that faded away as I lost myself in uncontrollable nostalgia. Most of the actors nail their performances as if they’d never left, though some, like Scrooge McDuck and Magica De Spell, are definitely showing their ages a bit – the actors for are both more than 90 years old at this point, and while they do an admirable job, they sometimes lack the pep they once had back in the 1980’s. That’s not so much a complaint as it is an observation, however. The twist is that the added narrative finally gives levels a much needed objective. Everything’s still structured as such that you’re still largely left to explore stages at your own pace, but now you’re exploring them with a real purpose, as opposed to being left to aimlessly wander. WayForward even obliges with a map screen so you can keep track of where you’ve already been. How much plot each stage has varies depending on locale; the opening to The Amazon stops you seemingly ever few steps as Scrooge uncovers 8 gold coins used to open up the second half of the stage, while The African Mines level is largely plot-free, outside the brief intro and boss scenes. On the bright side, if the new cutscenes bother you, there’s always the option to skip them from the pause menu. Wayforward are still masters of 2D artwork. Seeing these backgrounds in motion are a sight to behold. So then I guess the question comes down to this: does DuckTales still hold up? As somebody who did not know how to really enjoy the game until a couple years ago, I’d say yes. Does DuckTales Remastered do the original game justice? For the most part, that’s also a yes. WayForward took a classic NES game and modernized it in the best way possible, while still retaining that specific “DuckTales” feel in the controls and music. The only question I cannot answer is what this does for you if you’re either too old or too young to have seen much of the DuckTales cartoon in its prime. But I suppose that was the thing: people loved the original DuckTales because it transcended merely being a licensed game and was legitimately enjoyable on its own merits. Of course, with the extra storyline hooks in Remastered, it now matters a little more to have an understanding of who these characters are and how they interact with one another, though probably not enough that it would ruin your enjoyment of the game if you weren’t familiar with things. If there was one major downside to DuckTales Remastered it would be the length, but I even hesitate to call that a negative. Fans of the original NES game will know that even casual playthroughs can usually take less than an hour, and while Remastered is most definitely a lot longer than that, it’s still the kind of game you can finish in a single sitting. Upon checking my gameplay stats after beating the game, my completion time read just shy of three hours. There’s nothing wrong with short games, but its $15 price tag feels just a little bit too expensive. I guess I also ran in to a few tech problems while playing the PC version, too – on my system, the game has a habit of crashing after every level I beat (thankfully, I never lost any progress). Presumably that won’t be an issue in the future – WayForward is already soliciting feedback in the official Steam forums in an effort to track down and squash bugs like these. If DuckTales Remastered were $10, I wouldn’t have any trouble recommending it to anyone and everyone. Unfortunately, at $15, I’m a little more inclined to recommend this to fans of the original DuckTales cartoon – if only because I found myself so overwhelmed by nostalgia while playing Remastered that I have difficulty rationalizing what it must be like not to overtly love these characters and their continued adventures. The Disney Afternoon was my childhood, and as a result, I came away from this game with a big dumb grin on my face. And really, that’s just about the best outcome you could hope for.